On Wednesday, August 22, three members of Missouri Task Force 1 were activated to deploy to the Hawaiian Islands in preparation for Hurricane Lane’s landfall. They join 21 other members of the White IST (Incident Support Team) deploying today to Hawaii. These 24 IST members join an advanced element of the FEMA US&R (Urban Search and Rescue) White IST that was deployed yesterday. In addition to the White IST, three Type 3 US&R Task Forces (CA-TF8, CA-TF3 and WA-TF1) were activated to deploy today. UPDATE: All three deployed MO-TF1 members have arrived in Honolulu, Hawaii. They are hard at work as members of the White Incident Support Team who are developing contingency plans, interacting with their state and local emergency management and search and rescue (SAR) partners and preparing a wide variety of response plans for potential search and rescue scenario’s. Additionally, one more MO-TF1 member has been alerted (placed on standby) for a potential deployment to Hawaii as a Deputy Operations Section Chief. UPDATE: A fourth member of Missouri Task Force 1 has been deployed to Hawaii as part of the FEMA Incident Support Team to assist with the aftermath of Hurricane Lane. He will be working as the Deputy Operations Chief coordinating search and rescue missions around the islands. He is scheduled to arrive this afternoon and could be there for up to two weeks. 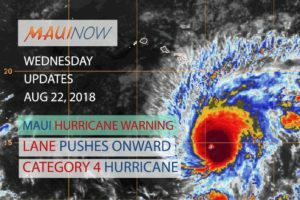 UPDATE – August 27 – Three members are currently still deployed to Hawaii for Hurricane Lane. The Deputy Operations Chief was assigned to Division A, which is the Big Island, directing and coordinating missions assigned to CA-TF3 and WA-TF1. These missions have been primarily recon and humanitarian type missions based on local needs. The Situation Unit Leader continues to collect and organize information for the IST and the Structural Specialist continues to evaluate identified damaged buildings and providing support to the Incident Support Team Leader. Our US&R Specialist has been demobilized and will be returning to Missouri today or tomorrow. We would anticipate the remaining three members will be demobilizing tomorrow or Wednesday sometime.